Working in the rigging and lifting industry is dangerous because it can cause severe harm to people and property. Those who work within these fields recognize the gear and accessories used for lifting must be a perfect fit for machines and jobs—close is not close enough. Any procedure, safety measures, and equipment specs must be exact. The first step for enhancing safety on the job site is to train individuals that will work lifting machines. After you find the right workers, you then must focus attention on proper equipment for the job. There are a lot of different rigging supplies, and each type has its distinct characteristics, reputation, and capabilities. It is not uncommon for riggers to struggle with picking the correct lifting equipment for specific jobs. To make choices more manageable, there are three things to pay attention to that can help narrow down options. What objects do you need to lift? Does it have sharp corners and where is the center of gravity? Do you have much lifting space to work with? Answering these questions first will significantly narrow the options for rigging gear that can be safe and effective for your needs. Make sure you know the exact load limit you are working with. In other words, a load limit is a maximum weight that can be safely lifted given the rigging equipment used. All gear will indicate these limits, so it is your responsibility to pay close attention. A single weak area can put the entire operation at risk. Check weight loads and then buy gear rated for that weight. Temperature is also a factor for consideration. Extreme temperatures, both low and high, can negatively affect operations if the correct rigging supplies are not used. Hot environments are better suited for wire ropes whereas cold climates benefit from fiber cores. We carry a full-line of rigging supplies, including chain slings, wire rope slings and polyester web slings, so reach out to us if you need rigging equipment. Our team will guide you to options that are a perfect fit for your gear and lifting applications. Do not wait for your next accident. 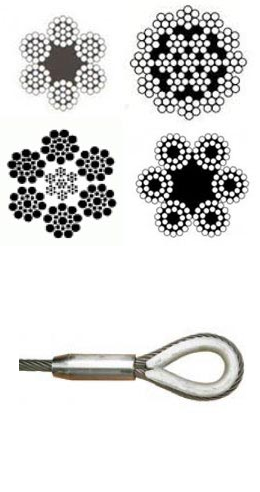 Be proactive with the health of your wire rope. Make sure to properly use ropes, meaning acquiring necessary rigging supplies, like nylon slings or wire rope sling. It is imperative you monitor your wire ropes and that they get retired before a problem or accident occurs.